HOW IS IT ALREADY OVER? I took a personal day and read this 699 page beauty in one day and I still can't believe the next installment of my favorite series is already over. So many emotions, surprises, twists, and turns, and I have no idea how I survived that book! 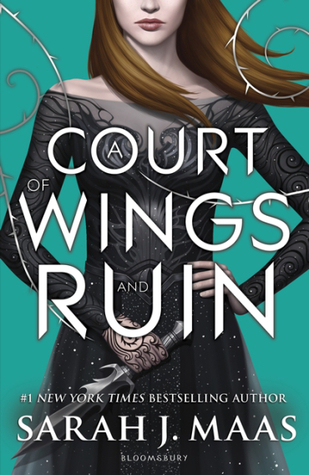 I am not going to give a summary of the book to avoid series spoilers, but just know that this is the third book to the A Court of Thorns and Roses series. These books deal with a conflict among the Fae and between the Fae and the Human race. I was utter trash for Rhys and Feyre in ACOMAF and I've got to say, I think I liked ACOMAF more because of the uncertainty and angst that wasn't present in this book. Don't get me wrong, I loved their relationship in this book, but I love the journey and resistance of beginning of a relationship in a book over reading about a couple that's already together. Instead, this book focused a lot more on war and political talk. There was a point about 160 pages in the book that reallllyyyyy slowed down and I was actually dozing off. I think that things started with a bang and were really intense, but then some strategy had to be discussed and things really slowed down for about fifty pages. Once the talk was over, though, there were intense battles and heart-pumping scenes that had me hanging on to every page. Overall, I absolutely loved this book and am dying to figure out who the next books are about. Like I said, I think ACOMAF is still my favorite in the series because of the romance junkie that I am, but I still loved this book and could not stop reading. My heart was jumping out of my chest and I freaked out on more than one occasion. For an AMAZING series and the amazing conclusion to Rhys and Feyre's story, you have to pick up ACOWAR! Holy cannoli! Kuddos to finishing this in a day! It is SO big!